July 17, 2013 – At 4:00 a.m., indigenous dwellers in the Darién rainforest, Republic of Panama, barricaded the Inter-American Highway near the community of Arimae, about 100 miles east of Panama City. Truckers and other travelers were unhappy. Indigenous leaders demanded a meeting with a government Minister and enforcement of the policy against non-indigenous squatters occupying their land. The next day, the Minister appeared. Native control of the land was acknowledged, and the immediate crisis was resolved, but permanent legal recognition and indigenous communal ownership of the land is still pending. Blockading the Highway. No pasarán. What century are we in? What have we learned? And has it made a difference? But why should we care? What basis could there be for solidarity between trade unionists in modern society and traditional peoples confronting powerful agricultural interests in the jungles of Central America? A shared commitment to communal, rather than merely individual rights, might be one point in common. The desperate need for all progressive forces to stand together against predatory capital could be another. A common interest in preserving a livable climate might be a third. What first struck me, as I heard an indigenous leader speaking to a group of ex-Peace Corps Volunteers in Panama a few months ago, was the similarity in strategy and tactics between the sometime victims of capitalism in our two countries. The combination of self-organization, alliance-building and legal, political and direct action that once worked for us – and which we must now re-invent – is also showing results in the forests of Panama. Though our situations vary, history has shown that large numbers of people united behind a cause can defeat large amounts of money – but it takes purpose, solidarity and courage. U.S. unionists should also consider some more specific common interests and responsibilities. Panama could be a natural meeting point for global union-building north and south of the U.S. border. The country was born when warships sent by U.S. President Theodore Roosevelt “liberated” the Isthmus from the nation of Colombia to facilitate construction of the Panama Canal. As Teddy put it, “I took Panama.” If every U.S. hotel chain, two separate Trump towers, and regional offices for U.S. business of every kind now rule the Panama City skyline – what holds poor and working people in our two countries back from common endeavor? After centuries of capitalists allying to extract land and wealth from the people of Panama and the world, is it not time now for us to support the struggle for communal space, common wealth and ecological sanity for our planet — and to build bridges to the progressive allies we badly need ourselves? So who are the indigenous in Panama, and how do their lives touch us today? For hundreds of years, the Wounaan and Emberá people, and members of other tribes, lived in the “undeveloped” jungles of the eastern[iii] Darién region and the eastern Chimán (Pacific) coast district by fishing, hunting with bows and arrows, and gathering. They wore few clothes, spoke indigenous languages, and were largely undisturbed by modern society. The Inter-American Highway, which otherwise stretches unbroken from Alaska to Patagonia, ended at the beginning of Darién province, not starting again until beyond the Colombian border. But, beginning in the 1970’s, well-off cattle ranchers and subsistence farmers from Panama’s developed interior, after years of land disputes with each other, began pushing to open up the jungle. 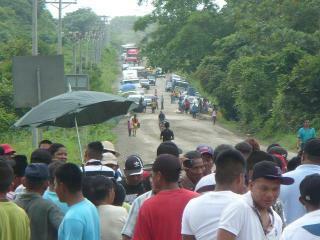 The activist Omar Torrijos administration began extension of the Inter-American Highway into the Darién, while also establishing a number of reservations (“Comarcas”) for native residents. As in the United States, however, indigenous who did not happen to live in the areas set aside for them, did not wish to move from their native land. In eastern Darién province, where the Highway is still being built; and in the eastern Pacific coast area, separated from the Highway and the rest of Panama by a mountain range on one side and miles of mangrove swamps on the other, conflicts began between natives and “colono” (colonist) squatters. The colonos themselves are divided between agribusiness loggers (some from Korea and other countries), large-scale cattle ranchers connected to Panama’s leading families, and subsistence farmers pushed out of depleted land in the western interior, who may combine farming and cattle-raising as they are able. The loggers are primarily interested in the valuable native rosewood trees scattered throughout the forests. Over time, the indigenous themselves have adapted increasingly to some aspects of the modern world as well, sending some children to Panama schools, and earning income from the sale of palm-frond baskets, rosewood carvings and other crafts to Panamanians and visitors from around the world. But the indigenous and the interlopers deal very differently with the land. The argument for “best (economic) use” of the forest land may favor indigenous development. But the forty-year struggle for control of the rainforest land has been hard, and it continues. Throughout the 1990’s and up to the present day, indigenous communities have made a series of requests to national government Ministries for protection of their land from what they perceive to be illegal colonization. In the mid-1990’s, seventeen Emberá / Wounaan communities formed a unified “Congreso,” and petitioned the National Assembly to pass legislation under which indigenous communities outside of the comarcas could establish legal title their land. At times, the government has responded to indigenous petitions with promises, and at other times with simple neglect. And neglect has sometimes led to violence. On November 12, 2000, armed colonos appeared in the indigenous community of Río Hondo to menace the Wounaan with a show of force. One year later, Wounaan indigenous in the Chiman district took matters into their own hands and burned the houses and storage sheds that had been built by colonos on Wounaan lands. After a short respite, the colonos returned, and the government did not take action. Along the way, however, there has been progress, much of it in response to actions of the Inter-American Commission and Inter-American Court of Human Rights. In 2001, the Court of Human Rights found that the Nicaraguan government had violated international agreements by depriving the indigenous Nicaraguan community of Awas Tingni of rights to communal property and judicial protections. 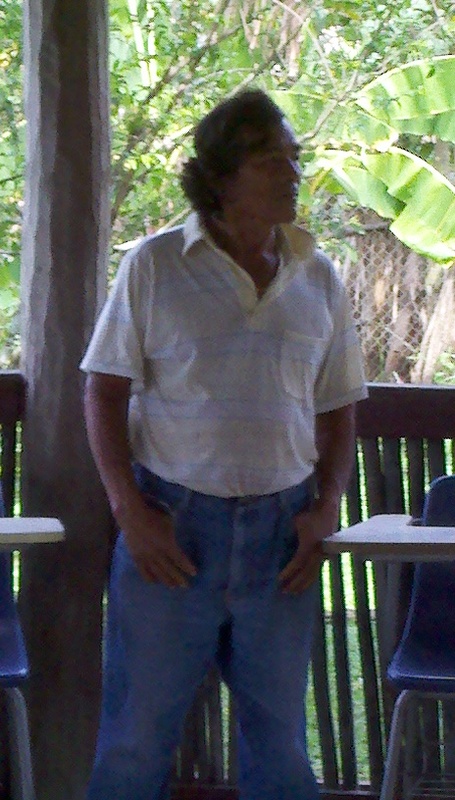 Nicaragua was ordered to provide a mechanism for the indigenous to title their lands. The precedent is relevant to the Panama situation. In October of 2008, Panama was forced to defend itself as the Wounaan joined with other indigenous peoples to testify at a hearing before the Commission on Human Rights in Washington D.C. A few weeks later, the Panamanian Assembly approved “Law 72,” finally creating a legal process for titling communal land. And in 2013, the first two indigenous communities in the Pacific coast area – Puerto Lara and Caño Blanco – received communal land titles. Consistent with past practice, however, twelve other indigenous communities in the Darién / Pacific coast area remain without title to their land, about 50,000 hectares of rainforest. And on at least three occasions, in 2011 and 2013, indigenous Wounaan and Emberá in Arimae have resorted to blockading the Inter-American Highway, to get the government’s attention once again. Two groups founded by former Peace Corps Panama volunteers – Planting Empowerment (http://www.plantingempowerment.com/) and Native Future ( www.nativefuture.org/ ) are working today in their former communities with Panama indigenous. Planting Empowerment is organized as a business, with funding from Kiva and other small lenders. They own a small amount of land in the Darién, near the Arimae community, where they train both indigenous and colono small-holders in sustainable tropical forestry – selective, rather than clear-cutting, mixing native and existing “invasive” species in preference to monoculture, harvesting and replanting on a schedule that retains the forest, selling 25-year leases to keep small-holders from literally “cutting and running” to another forest site – and in marketing of their products. Native Future’s provides education and legal training, finances legal cases, and supports community organizing aimed at gaining definite land tenure for the indigenous. Both groups also coordinate with the Rainforest Foundation ( www.rainforestfoundation.org/ ) in their efforts to protect rainforests and their indigenous residents, and to promote ecological best practice. European intervention in the Americas began in mistrust and conflict with native peoples, often including slaughter or enslavement, and moving on to the seizure of the continents’ land and resources, with reservations, raids and roundups for the indigenous. Today, there is growing recognition that Euro-Americans have much to learn from the sustainable lifestyle they supplanted. Organized and unorganized labor has no less to learn and contribute to a sustainable future than do our corporate adversaries. In the “battle of Seattle,” in the year 2000, labor reached what now looks like a high point in our power to resist the global destruction of our rights, as labor and environmentalists (“Teamsters and turtles”) fought together for democratic participation in international trade agreements. For a brief period of time, President Clinton was impressed, appearing to believe he would need our willing cooperation to achieve his own global ambitions. We let that opportunity, and that cooperation, slip away. In Panama, and in other parts of the Americas, indigenous people are now fighting in the way we have fought, to protect their rights – and also to protect natural resources we all rely on. Which side are we on? [iii] A traveler from North to South America through the S –shaped Republic of Panama actually moves mostly from west to east. [i]No one I knew then would have dreamed of calling my home town – Mammoth Hot Springs, Yellowstone Park, Wyoming – a socialist paradise. We were a small town in Wyoming, virtually all white, often Republican, all “middle class”, and the self-definition “American as apple pie,” might as well have been invented there. Still, the world where I grew up, though normal to me, in retrospect was an unusual place. We moved there in 1946, when my father found steady personnel work for the National Park Service. I was one year old. We lived with elk and mule deer in the front yard, coyotes singing at night, black bears raiding the trash. No hunting or domesticated animals – no pets – were allowed. We moved into half of quite a large house on what had been Officer’s Row when the Army ran the Park. in the early 20th century. We were assigned there, instead of smaller quarters, simply because there were five children in our family, and we might need the space. The quite logical principle: to each according to need. Yellowstone in those days was socialism of a kind. Environmentalism, too, of course – though no one had ever heard that word. Virtually every parent in the 300-person headquarters town (fewer in the long winter) worked for the government. Haynes’ Picture Shop and Pryor’s general store were rare for-profit exceptions to public rule. No one was rich, no one was poor, and no one was unemployed. No one killed animals inside the Park, either, except for the occasional bear that bothered tourists one time too many. (Well, we kids occasionally trapped the gophers that ate from our mothers’ gardens, or shot them with a b-b gun.) For many parents, their work was a calling, not just a job. When a million outsiders pass through your town every year to appreciate where you live, and how you protect it, insulting jokes about “not bad, for government work,” are rarely heard. Most people, from the plumber to the Superintendent, attended the same non-denominational Protestant church, and all the kids sang in the same choir (from each according to ability, even for those of us who had no ability.) At Christmas, we managed to perform the long and complex “Messiah,” by Handel, for ourselves. My mother played the organ. The part of the sermons that struck me the most was where Jesus said it would be harder for a rich man to get into heaven than for a camel to pass through the eye of a needle. The Bible seemed clear on that. No problem for anyone I knew; my grandfather had been a wealthy magazine publisher years ago, I was told, but lost it all in the Depression. The bizarre ignorance, cruelty and injustice of what passes for Christianity in some parts of the country has always seemed like sacrilege to me. But there was little diversity in Mammoth. The Catholic minority had to travel five miles to Gardner, Montana on Sundays. Jews, African- or Hispanic-Americans were not present. There was one wedding, around 1950, of a European-American male and a woman descended partly from the famous Native American guide, Sacajawea – but she was exceptional, recognized as royalty in a region where Lewis and Clark, and early trappers like Joe Meek or Jim Bridger, were up there with Washington and Jefferson as founding fathers. But, we did learn as kids who had been there before us, as we dug up Indian arrowheads from the ground, or discovered wooden sluice-boxes left by miners looking for gold, in the stream running down Mt. Sepulchre. Fireside slide shows by well-informed Rangers and Naturalists were part of the regular entertainment. We loved the stories about heroic public-spirited people who rescued Old Faithful or the buffalo herds from greedy hucksters who would have purchased little parts of our Park for private exploitation. We also heard, many times, about Nez Perce leader Chief Joseph. His people, driven out of Oregon by settlers a few months earlier, crossed Yellowstone in August, 1877, en route to what they hoped would be peaceful hunting ground in Canada. Several skirmishes took place inside the area already set aside for the Park, with troops commanded by Gen. William Tecumseh Sherman, remembered for his fiery march through Georgia in the Civil War. Chief Joseph, a Christian convert, was revered among us white folks for saying, after his final lost battle, just short of escape into Canada, “I will fight no more, forever,” and withdrawing with his people to the reservation. The 1877 “Nez Perce war” was the last Indian War inside the Park.Five years after that war, the Senate ratified a treaty with the Crow Indians, eliminating their title to land in the northern and eastern parts of the Park. The morning after the fireside shows, we could pick up the change fallen from the pockets of tourists seated on rows of logs. Of course, we had guns, for use outside the Park. This was Wyoming. My year-older brother Bill and I had to share one b-b gun. My eleven-year-older brother, Datus, was a hunter and fisherman who later wrote for Field and Stream magazine. Once, as the family sat around chatting in the guest bedroom, my brother Bill picked up a pistol to fool around with. We knew it wasn’t loaded; Datus was fanatical about that. Still, when Bill pulled the trigger, the gun fired down the hallway, the bullet lodging above the door, missing my parents and me, and barely missing my sister as she stepped into the hall. Before we knew what had happened, it was all over. No harm. Stuff happens. Our two-room elementary school, for 30 students in six grades, was not too different from schools in other Wyoming towns – good enough to prepare many of us for an interesting life. When you finished the assignment for your grade, you could work with the grade above. And… we had the world’s best sledding hill, covered with snow for a majority of the year. Unfortunately, due to the snow, paradise was closed to the public from Labor Day to Memorial Day. The tourists, on the rare occasions when we talked to them at all, told us we lived in Paradise, and we guessed we believed it. We didn’t know any different. I don’t understand to this day why many people in other places want so many more things, and so many have much less. There is plenty for all. Last month, all National Parks were briefly closed again, this time due to the Tea Party-fomented government shutdown. While some Governors moved to reopen some Parks using State money, conservative Republicans in recent years have often shamefully called for mineral mining or oil drilling inside National Parks. Grover Norquist, head of Americans for Tax Reform, is one of a number of Republicans who have called for selling the Parks to State governments – who lack the money manage them — or privatizing them. The greedy right brings to my mind the bad guys from the Ranger slide-shows about early days in the Park – bozos jamming a log down Old Faithful, or killing elk inside the Park, to sell as meat. Struggles between public and private interests, even in nationally protected areas, go back a long ways. The worst guys lose, but new bozos come along. The two most influential explorations of the Yellowstone area, both undertaken in 1871 with a view toward possible creation of a public Park, were led by environmentalists who marveled at the convergence of thermal wonders, abundant wildlife and spectacular terrain, and wanted to set the area aside for public appreciation. But then, as now, profit-seekers challenged the defenders of nature in defining the goals and character of the new creation. Northern Pacific Railroad entrepreneur Jay Cooke, of Philadelphia, arranged financing for the early expeditions, hoping to build a connector line through Yellowstone, passing near the geysers, and eventually linking with the Central Pacific railroad to the south. However, Congress approved no budget for the project. In absence of government authority, a private group calling itself the “Yellowstone Park Improvement Company” seized the opportunity to harvest and sell meat from Park animals, and to pursue a monopoly on hotel, stagecoach and telegraph service for tourists. The untrained and nearly unpaid “Assistant Superintendents” who were assigned law enforcement duties in the Park won notoriety for their drunken brawls, and were derided by Park residents as mere “rabbit catchers.” They sometimes collaborated with lawbreakers they were charged with arresting. Road-building in the Park proceeded, however, and tourists came in spite of all difficulties. Ultimately, in 1886, the Interior Department handed control over the Park to the U.S. Army, which acted efficiently to drive away poachers and any businesses that actually profited from the destruction of Park land or wildlife. The Army also built the excellent house where I spent my childhood. As for the Northern Pacific’s self-interested efforts to build an iron highway through paradise, that came to naught. Capitalism served, but did not rule. No rail line was ever allowed inside the Park’s border – but the railroad, running nearby, has benefited mightily nonetheless, like other surrounding businesses, from the millions of tourists visiting the area each year. Within the Park, the environmentalists, though making compromises with less committed people, are winning. In 1916, an “Organic Act” was approved, creating a new National Park Service to administer a growing number of National Parks, and to “conserve the scenery and the natural and historic objects and the wild life therein.” Since that time, the National Park Service has provided professional government management, leading to generations of increasing public use. Unfortunately, in Yellowstone, snow limited most public use to three months a year. While no off-road snowmobiling is allowed, up to about 500 more fuel-efficient snowmobiles may continue to travel in the 2,500 square miles of the Park on a given day, under new regulations. Then, in the mid-1970s, twenty years after my family’s memorable trip east to a new home in Philadelphia, in a beautiful, green Northern Pacific sleeping car with fantastic “vista domes” for observation, the first snowmobiles entered the Park. Quiet-loving animals and more rustic Park visitors were disturbed as well. In reaction, snowmobile use was sharply cut back, but some pollution continued. Then, on October 22, 2013, decades of wrangling were apparently resolved as the National Park Service issued final regulations, to take full effect in 2015. The number of snowmobiles allowed to operate on Park roads was reduced again, and new snowmobile emissions standards were established. 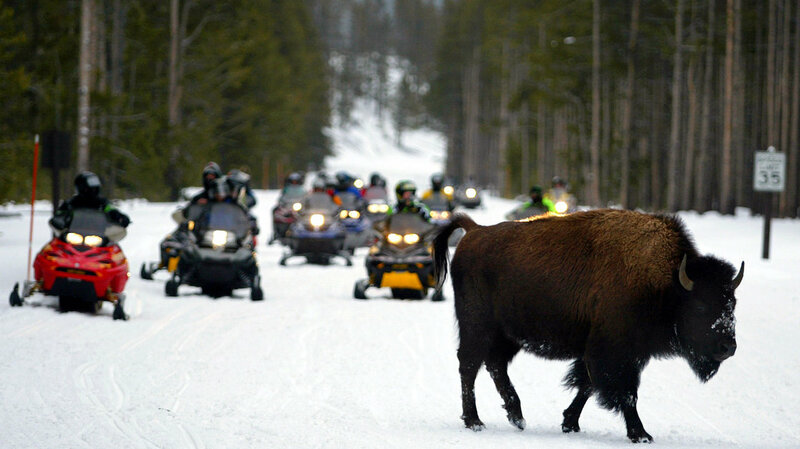 At this point, almost no snowmobiles can meet the new standards, but no one doubts that manufacturers will achieve them in return for the Yellowstone business. No less important, thanks to the somewhat noisy and polluting snowmobiles, a Park that was once reserved much of the year for just a few hundred residents, is now open year-round to the public. What we have is socialism, with compromises. These days, our National Park system appears to be strong and growing stronger. The National Park idea has spread not only throughout the United States, but around the globe. Kruger National Park in South Africa, to cite one example, is geographically larger than Yellowstone, and draws almost half as many visitors. The U.S. public loves their Parks, just like they love their Social Security and Medicare. Now, when would-be oil and mining profiteers push for privatization, or other foes of the public interest shut down the government, National Parks are an expenditure almost everyone agrees should NOT be cut, and not privatized. In Yellowstone, indigenous people were the one native species NOT on the list for protection. But down is not always out. Indigenous Americans, the majority now arriving from south of our border, may one day be the majority here again. The buffalos and the otters, of course, do not vote, but their interests have many people’s attention. The Park is noisy in some places, except when politics takes over and shuts it down. Xanterra may be pursuing a monopoly on lodging, and who knows what else, but they depend on public protection also. There is no railroad, and no Disneyland in Yellowstone, and some really expert and dedicated government employees protect our Park and educate the rest of us about it. 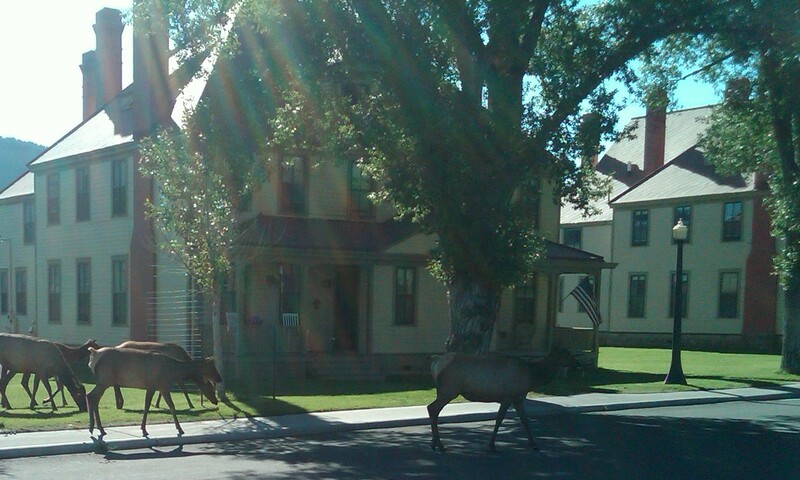 On my most recent visit to Yellowstone, with my wife, we stopped by the house where I grew up. The lady of the house came out to chat, and the Minister of the Park church ambled by. Turned out, he had been asked to marry a couple from England later that day, and needed witnesses! We volunteered, and took the wedding photos as well. The church where my mother had played the organ looked much the same as when I lived there. My name was still embossed, along with those of my childhood friends, on a Sunday School list. I don’t believe any more that there’s a guy in the sky, making things happen. We the people make the world what it is. But Yellowstone, and National Parks around the world are understood to be sacred spaces. A good start toward socialism.